The Designer program has two main ways of building, Geometry creating modules.. One-shot : These usually display a dialog box, the user adjusts some settings, then presses a button (OK), the action is performed and control is returned to the designer module. These are described in this document. Each designer geometry plugin is built as a Windows DLL, it will have one or more C or C++ language source file, one or more project specific header files, a Visual Studio project file, a resource file (.RC) , a module definition file (.DEF) a file with filename extension (.AFX for actions plugin, .DFX for a tools plugin). The project will build to a .DLL of the same name as the MFX/DFX file. The build files can have any location, but the AFX/DFX and DLL files must be placed in the "PLUGINS" folder. In the case of an Actions plugin, the resource file (.RC) will usually contain a dialog box description to allow the user to set up the action. To get a feel for a plugin action we shall look at a plugin for the Delaunay triangulation discussed in my book "Practical Algorithms for 3D Computer Graphics. The Triangulate action takes a matrix of isolated vertices lying an a plane and produces a triangulation that maximises the equi-angularity of the polygons. The screen on the top shows a group of selected vertices before the action starts. The screen on the bottom shows the results of the action. located in the plugins folder. The build process will create a DLL file called delaunay.dll in the plugins folder. As mentioned above the delaunay.afx file contains the text that will appear in the OpenFX plugin actions menu. In this case the file contains the text: "Triangulate... " so this is text that will appear on the menu. For this particular plugin action there is a very simple user interface dialog that just explains the action of the tool. The plugin code follows the basic design of a Windows DLL . In this section we will examine the parts of the Delaunay action source file that are common to all actions plugins. The most important items to be aware of are the name of the function called by OpenFX's designer module to execute the action called _Xmodeler(), the include files that define the OpenFX designer datastructures "struct.h" and the external function definition and global variable definition header file "dstruct.h"
The first two arguments are handles for the Designer's container window and the Designers information/status window at the bottom of the screen. Getting these handles allows the plugin to send messages to the designer, for example to write some informative text into the status window. The third parameter is the most important. The "lpevi" parameter is a pointer to the X__STRUCTURE data structure. The X__STRUCTURE structure is a global structure that contains pointers to the main data that the Designer module is currently holding, all the lists of vertices, edges, faces, skeleton, materials, maps etc. the X__STRUCTURE also has pointers to many of the Designers internal functions, such as those that create vertices, manipulate dialog boxes, etc. etc. The designer keeps only one copy of this structure, it is initialised at start-up and passed to all the plugins. By using the members of this structure any plugin can access all the Designer internal data and functions. This method is very simple and very flexible, just by using up some of the dummyV and dummyF variables extra variables and functions can be made available to the plugins in future releases of OpenFX without compromising the behaviour of existing plugins even at the binary level. return TRUE; // if effect worked FALSE if it failed. Accessing variables and functions in a DLL module through direct use of the lpEVI structure pointer is very tiresome. For example to use the Designer's number of selected vertices variable (called "NvertSelect") it would be necessary to use the code ( (*(lpEVI->NvertSelect)) ) to gain access to this variable. This is very messy! To overcome this issue and provide an interface to the designer's functions that make them look (in the code) just like normal function calls, a number of #defines are included in the header file "dstruct.h" , which is one of the two ".h" files that every plugin must include. Keeping this very important information in mind we can return to considering the Delaunay triangulation plugin action and look at the key code constructs. To return to the delaunay example, the algorithm for the Delaunay example and most of the useful code is explained in the book Practical Algorithms for 3D Comptuer Graphics... In this section we will not examine the algorithm we will just look at a key steps in the code and how they use the Designer's internal functions. Use a simple modal dialog box to inform the user about the action. If the user OKs the action then perform the triangulation. 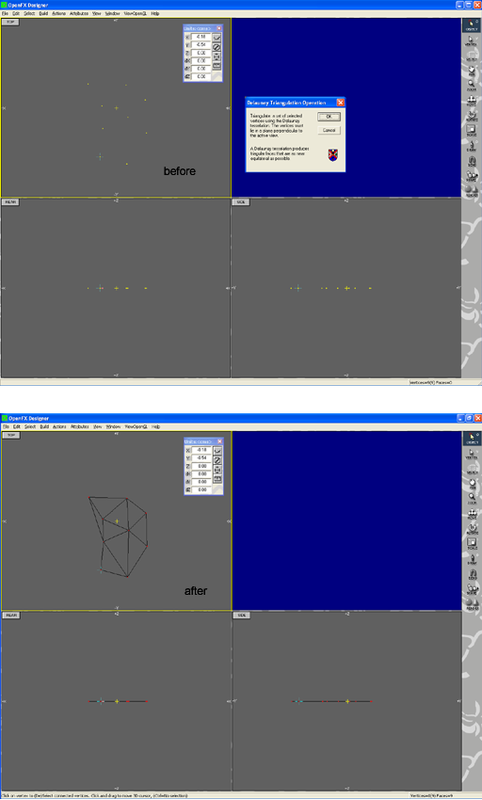 Since OpenFX is a 3D package the triangulation is performed in a plane parallel to the active window. This can be decided by using the "ActiveView" global variable and equating it to one of the built in constants for the TRI TOP, TRIFRONT(looking from the read) and TRIRIGHT (looking towards the left). In function "IntersectObject" a check is used to determine that there are at least three selected vertices. Then the algorithm begins. Before the vertices, edges and faces can be created the current mesh data-structes need to be enlarged to accommodate the extra items, this is done in calls to "UpdateVertexHeap(), UpdateEdgeHeap() and UpdateFaceHeap(), with 3,3 and 1 items respectively. Then the actual vertices, edges and face can be built in calls to "CreateVertex()" CreateEdge() and CreateFace()". For internal use of the plugin a copy of the vertex co-ordinates of the selected vertices is made to be used by the Delaunay triangulation generator. Then, for each point we insert it into the triangulation, continuing to do this until all the points have been inserted. As each point is inserted it may require the creation of additional triangle edges and triangles. The additional edges and faces are created by repeating the process of extending the data structures, and created the edge/face. As each point is processed a Vertex copy of it is made and the triangulation built around the copies. When the algorithm is complete all the old vertices are erased by a call to "EraseVertex(1)" which erases any selected vertices and also any edges or faces that connect with any selected vertices. Vertices that are not part of the triangulation (i.e. any that were not selected at the start, are assigned a temporary status of "INEDITOR" when renders them unaffected by any of the other actions in the code. This completes our discussion of the Delaunay example. You should look at the code for the other actions plugin, find and identify the similarities with this example and follow the logic of the argument. .